In America, we tend to parse out films about crime into specific categories, such as heist films, detective films, film noir, mysteries, and so on. In both East and West Germany, these films are lumped into one big group: Kriminalfilme, or “crime films,” usually referred to as “Krimis.” Many West German Krimis center around a murder, but this is more unusual in East German Krimis. Murder, as an individual crime, is seen as a symptom of capitalism and less likely to occur in the GDR. In West Germany, the criminals are often members of crime organizations run by an evil masterminds, best exemplified by the Dr. Mabuse films. In East Germany, these films often revolve around West Germans and foreigners who are using the disparity between East and West Germany for their own ends. Track in the Night (Spur in die Nacht) falls squarely into this category.1 Its original title was Schmugglerkönig (Smuggler King), which gives some idea of the subject matter, but also clues the audience in to the criminals’ motives early on. In Track in the Night, we follow the misadventures of a Berlin bricklayer named Ulli, who arrives in a small village on the Czech/German border to visit his girlfriend, Sabine. It’s skiing season, and Sabine is doing seasonal work at the local HO store. When she’s not there to meet him, he goes to the the Fuchsbau Inn where she’s staying, but Sabine isn’t there either. After a brief investigation, the local authorities decide Sabine is a Republikflüchtling—a person who left East Germany illegally—but Ulli doesn’t believe it and neither does Sabine’s friend and co-worker Traudel. Ulli starts his own investigation, and soon finds himself embroiled with a gang of smugglers. In some respects, Track in the Night resembles an Alistair MacLean story (The Guns of Navarone, Breakheart Pass), where we find out later that someone we thought was possibly a bad guy turns out to be a good guy, but a good guy in this case means someone who works for the Stasi. 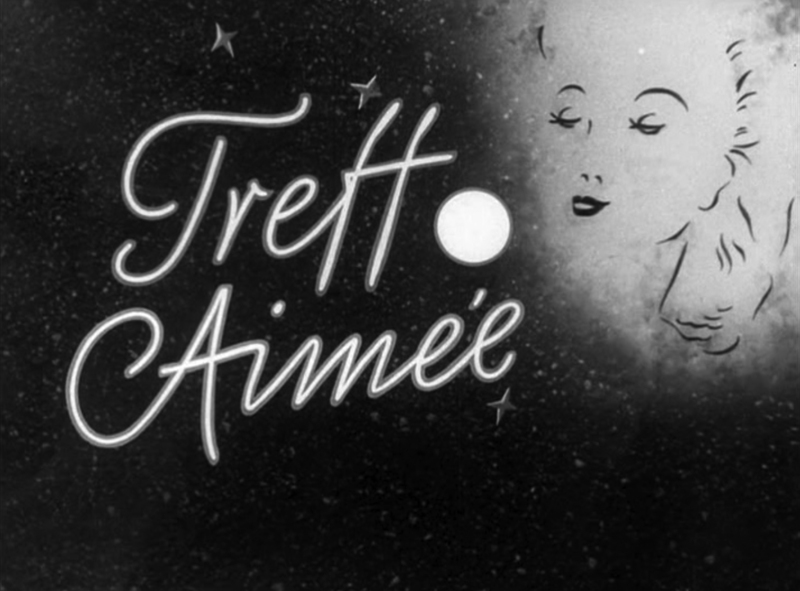 In other respects, it resembles the format pioneered by Hitchcock, where an ordinary man is thrown into a situation outside of his usual experiences, and is forced to play the hero. Track in the Night is the second film from director Günter Reisch. Reisch was one of East Germany’s most interesting and imaginative directors. He is best known for Anton the Magician, as well he should be, for it is a real classic, but his others films are also worth a viewing. Politically, he rarely rocked the boat, but this wasn’t out of timidity. He was resolutely socialist, and often attacked what he saw as a growing tendency toward bourgeois values in East Germany.2 His most unique contributions to cinema are the bookend films, A Lively Christmas Eve and Like Father, Like Son, filmed twenty-five years apart with nearly the same cast, right down to the bit parts. Playing Ulli is Ulrich Thein, and this is his movie he appears in nearly every scene. He even takes to singing and playing guitar at one point. The song he sings, “Fuchsbau-Boogie,” was composed by Thein; rather quickly from the sounds of it, but it’s supposed to be an impromptu song anyway. Thein was a man of many talents. Although best known as an actor, he also directed films and plays, composed songs, and wrote screenplays. He died in 1995 in Berlin (for more on Thein, see Anton the Magician). 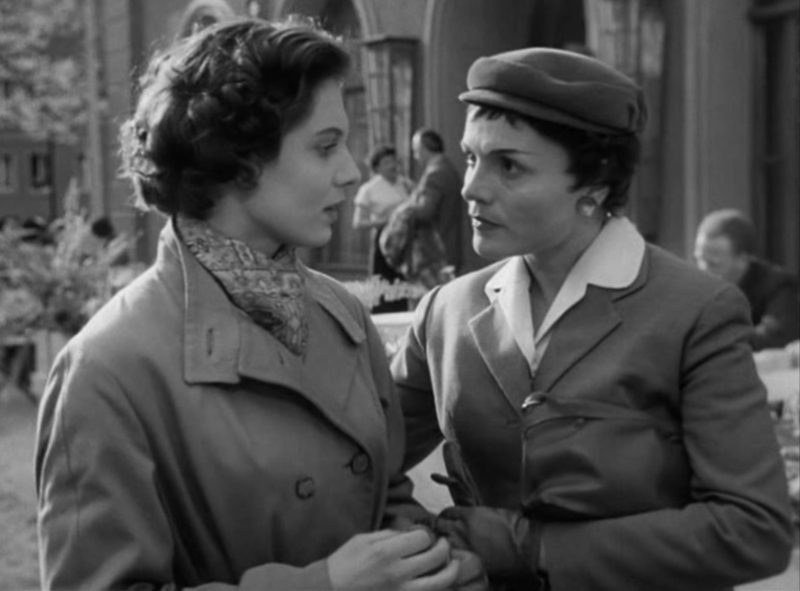 Track in the Night also stars two of East Germany’s most beautiful actresses: Eva-Maria Hagen and Annekathrin Bürger.3 For Hagen, this wasn’t the first film she worked on—that would be Don’t Forget My Little Traudel—but it was the first film featuring her to reach the theaters. Her acting duties here are limited. She doesn’t appear until the last half-hour of the film, and even then only in a few scenes. These two movies arrived in theaters within weeks of each other, kicking Hagen’s career with a roaring start. Annekathrin Bürger had already made a splash in her previous film, Gerhard Klein’s A Berlin Romance. When Track in the Night was made, Bürger was romantically coupled with her co-star Ulrich Thein. After splitting with Thein, Bürger dated and married fellow actor Rolf Römer. Although Römer is now dead, Bürger is still going strong and regularly performs programs of songs and poetry (for more on Bürger, see Hostess). Bürger’s contribution to the plot is not as limited as Hagen’s but the story doesn’t revolve around her either. 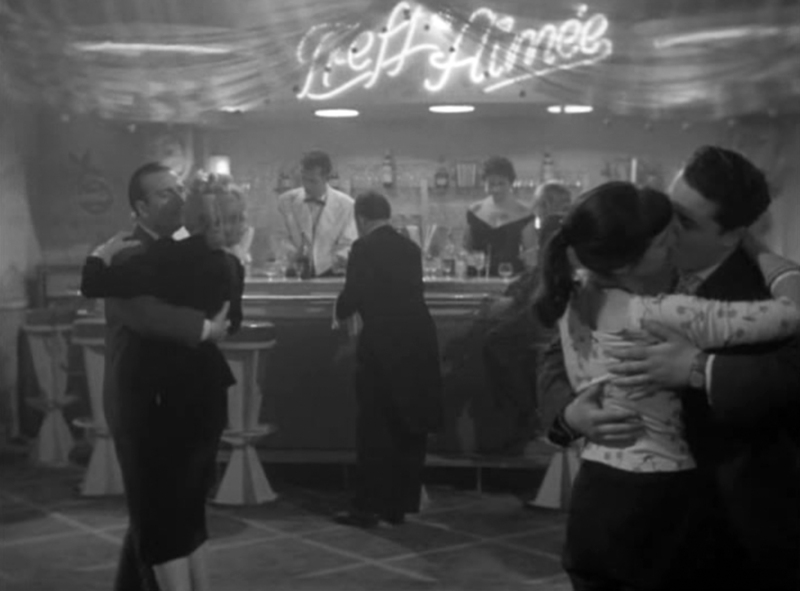 The music is by Helmut Nier, a classical composer, who brings to the score a nice Gershwinesque jazziness. Those who have seen New Year’s Punch, which was also scored by Nier, will recognize certain leitmotifs Nier used again in that film. The cinematography is by Walter Fehdmer, who worked in East Germany until the Wall went up, and thereafter worked in West Germany, suggesting he either chose this time to leave the country or, more likely, found himself cut off from his former employer. He retired from film work in 1970. No death date is listed for him, although, since he was born in 1913, he is either dead, or one of the oldest men in Germany. Fehdmer’s work is adequate, but not on a par with the likes of Rolf Sohre, Günter Ost, Joachim Hasler, or Werner Bergmann. Track in the Night is not one of the most daring or inventive Krimis to come out of DEFA. Those would come later. But it is entertaining, and has a perspective that is completely at odds with our western way of thinking.The proposition that it’s good to cooperate with the Stasi is not a position that one is likely to see repeated anytime soon. Even at DEFA, this position became less and less common as the Stasi became more and more invasive. 1. Note: I’ve translated the German word Spur as “Track.” This film could also be called “Trail in the Night” or “Trace in the Night” (the more common translation of Spur), and both would fit. The English word “spoor” comes from the same root, although it has lost much of its meaning in English and now is usually reserved to talk about animal droppings. I’ve chosen “track” in reference to one specific scene in the film, which I believe the title is in reference to. 2. Sadly, I never met the fellow, but reports from friends and associates make him sound like a wonderfully cantankerous old coot. I think I would have liked him. 3. Although most of the time I use the now gender-neutral “actor” in all cases, somehow the phrase “beautiful actors” just doesn’t work for me, so I’ve made this exception.